I posted this post on Facebook yesterday. Of all the things I've posted over the last year, this one was shown to more people than almost any of my other posts (don't even get me started on FB not showing my posts to everyone who "likes" my page. It's ridiculous.). This is what I posted, for those who don't have Facebook. Our plane isn't even in the air and we're already starting another project. Our plan has been to take the new plane out to Bethany Village. There is a dilapidated house out there that we were going to fix up, and there is the beginnings of a hangar out there - which was the biggest benefit. The new plan is for us to return to Paruima - which is very exciting (It's also the part of our lives that THE book is about, so it will be good to be back out there!). The only problem with Paruima is that there are not enough houses for the missionaries. This means we have to build. Paruima is a better fit for our family for several reasons, mainly because that is the region we will be flying (Region 7). It will save time and money to keep the plane out there and then be able to shuttle people/pastors/workers around as needed. We were able to secure a fuel source for a good price that is close, so that will also keep our operating costs down as well. Friends, we can really use some prayers on this matter. As it turns out, we're not independently wealthy. And out house will cost money to build, money that we don't have yet. We're just on the tail end of finishing our airplane (our goal is to be in Guyana early October). And that was a huge undertaking to finance. Now this. We know that God has provided all we needed for our plane and we know He's not going to stop providing, but it's still scary to move forward in faith into another big project that we weren't expecting. If you could just pray with us, we'd be mighty grateful. My disclaimer: I'm not an architect. Actually. And so things might not be quite right. 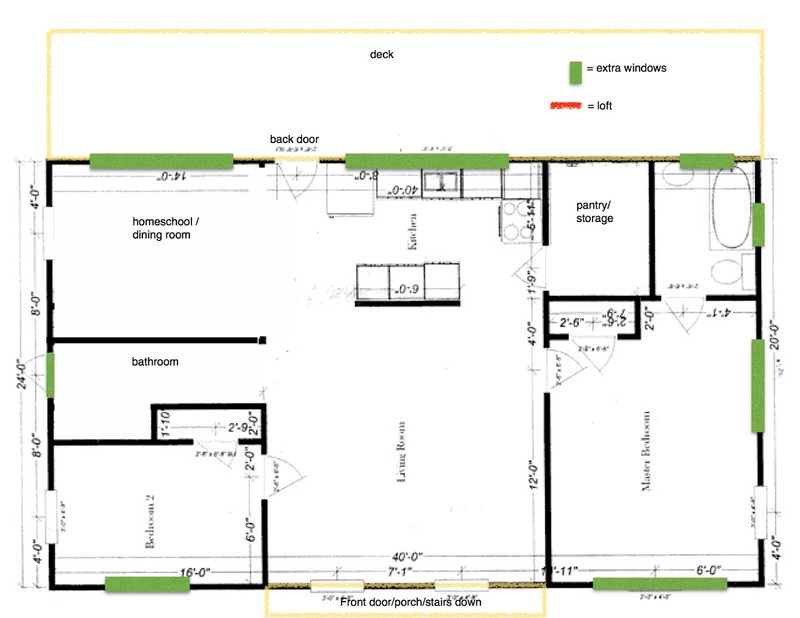 Don't tell anyone, but I started with an image I found online (that someone else had probably found somewhere online) and there was no credit to the actual architect that made the floor plan I altered. If you see this, and recognize it as your own work, please let me know so I can give credit. It's open and light and I can't wait to move in! Our boards are already being cut, and we are hiring local workers to build it. It's going to be great! It will be on 8-foot stilts like all the other houses, so we'll have a bit of an open space underneath. If we can get a generator, we'll fly out our washing machine that's in Georgetown and that will stay under the house for washing laundry. Hang to dry. One of the things I'm most looking forward to is unplugging. No phones, internet, Facebook, email, etc. etc. etc. unless we're intentional about it. We also won't have electricity, refrigeration, etc. We'll have solar panels to power some things, and the generator for the washing machine, but that's it. We're unplugging. If you would like to come out to Paruima and help build our house, we'd love to have you come out! :) Still waiting for someone to take us up of our offer to visit. Come on down! ideas as well. Thanks for sharing! Prayers that the finances will come through for you! Nice design of refrigerator now you can convert it in the solar refrigerator by using solar panels. Researchers use this solar panels in their refrigerator in solar vaccine refrigerator and solar powered refrigerator for their research.